Neuroscience is an interdisciplinary field that examines the bidirectional interrelations between the nervous system and environment and includes perspectives from the natural sciences, social sciences, and humanities. 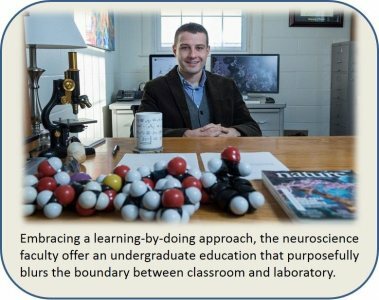 Majors build a strong foundation in the sciences to explore core domains of neurobiology, physiological psychology, cognitive neuroscience, and computational neuroscience through classroom and laboratory experiences. Students then extend and apply their knowledge with neuroscience-related electives and course work that critically examines the theories and practices of neuroscience from ethical, sociolcultural, and other humanistic perspectives. Progress through the major culminates with a senior capstone experience. 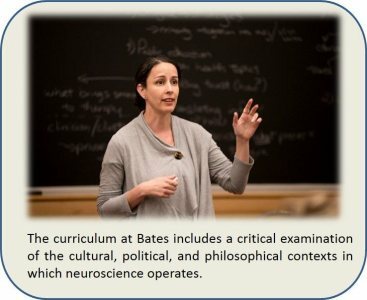 More information on the neuroscience program is available on the website (bates.edu/neuroscience). Students interested in declaring the major may take the introductory course in their first or second year. As performance in this course is predictive of future academic success in the major, students whose performance is below a B- who wish to pursue the major should consult with the program chair about their academic preparedness for subsequent neuroscience courses. Given the emphasis on quantitative reasoning in neuroscience, prospective majors whose score on the college’s Quantitative Reasoning Assessment (QRA) entrance exam is at or below the fiftieth percentile are cautioned against majoring in neuroscience without further intensive preparation in mathematics. Students in this situation are advised to consult with the program chair to identify a suitable plan to address their level of college mathematics preparedness. Major Requirements for the Class of 2021 and beyond. There are fourteen courses required for the major, with courses distributed across Groups A, B, C, D, and E. NS/PY 160 must be taken prior to junior year; Group B should be completed prior to senior year. NS/PY 160. Introduction to Neuroscience. NS/PH 117. Brain Imaging: How Imaging Reveals the Brain and How the Brain Creates Behavior. NS/PY 319. Physiological Profiles of Mental Illness. NS/PY 361. Topics in Affective Neuroscience. NS/PY 364. Biopsychology of Smell. NS/PY 399. Junior-Senior Seminar in Biological Psychology. PSYC 302. Sensation and Perception. Students cannot count more than one 100-level and one Short Term course in Group C. Students may apply additional courses from Group B to Group C if they wish. Students may count either BIO 102 or PSYC 302 toward the major, but not both. FYS. 478. The History of the Brain. ENG 395I. Literary Imagination and Neuroscience. MU/PY 253. Music and the Embodied Mind. NRSC 130. Neuroscience of Morality. NRSC 208. Neuroscience, Ethics, and Society. PHIL 233. On Being Human. NRSC 457-458. Capstone Thesis in Neuroscience. NRSC 459. Community-Engaged Learning Capstone. NRSC 460. Capstone Seminar on Cellular Neuroscience. NS/PY 461. Capstone Seminar on Psychoendocrinology. NRSC 462. Capstone Seminar on Computational Neuroscience. NS/PY 463. Capstone Seminar on Human Cognitive Neuroscience. Double Majoring in Neuroscience and Biochemistry, Biology, Chemistry, or Psychology. Students may not double major in neuroscience and biochemistry, biology, chemistry, or psychology. Transfer of Courses. A maximum of two non-Bates courses can be counted toward the major, pending approval from the program chair. Major Requirements for the Classes of 2019 and 2020. Students take fourteen courses. NS/PY 160 must be taken prior to junior year. At least two of the three 300-level courses must be taken prior to senior year. 2) Electives. Three courses from the two elective lists below, either all three from list A or two from list A and one from list B. Students are encouraged to take these courses from different faculty members. Students may count PSYC 357 or s51B toward the major but not both. Only one Short Term course can count toward the major. NS/PY 304. Embodied Cognition, Technoculture, and Furture of Identity. PHIL 236. Philosophy of Knowledge. PHIL 321J. Topics in Contemporary Philosophy of Mind and Language: Self-Knowledge. PHYS 301. Mathematical Methods of Physics. Senior Capstone. The senior capstone may take one of three forms: an empirical thesis, a capstone seminar, or a community-engaged project. 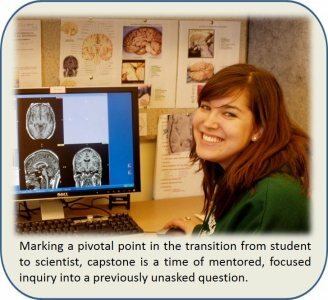 Guidelines concerning the capstone process are available on the neuroscience website. Students planning to minor in chemistry may not use CHEM 321 toward both the chemistry minor and the neuroscience major. Transfer of Courses. Neuroscience majors may transfer up to two non-Bates credits toward the major, provided that the credits are pre-approved by the program chair.